Toastmasters produces results. Since 1924, Toastmasters International has helped more than four million men and women of all backgrounds become more confident in front of an audience. The friendly and supportive environment, along with the learn-by-doing programs, are sure to help you become a better speaker and leader. It's for Everyone: Whether you work in a corporate environment or from home, whether you are a student or retiree, Toastmasters is the most efficient, enjoyable and affordable way of gaining communication and leadership skills. It helps you to be a better speaker: Toastmasters will give you the skills and confidence to effectively express yourself in any situation. By learning to formulate and convey your ideas, you open a new world of possibilities. It gives you tools to become a stronger leader: Leadership is comprised of two things: communication and teamwork. In Toastmasters, you will do both. And you will find out how to vary your approach to suit the needs of different people, be they the audience for a speech, the committee for a fundraiser, or your coworkers and managers. It helps to rid your mind of fear: Believe it or not, your chances of dying of stage fright are extremely slim. There is no need to worry! The environment is friendly and supportive, and the self-paced program allows you to build confidence with each speaking assignment. It gives you tools to make progress: With the help from evaluators, you will find out you are making a lot more progress than you may have imagined! Learn, build your confidence, and push yourself outside your comfort zone. It is a safe place where there is no penalty for failure! 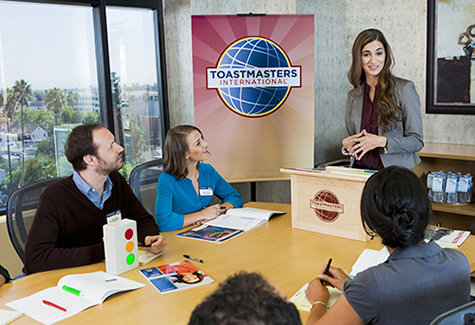 Members learn how to present prepared speeches based on projects from manuals in Toastmasters' programs. Members receive constructive evaluations to point out speech strengths and offers suggestions for improvement.